In Situ Chemical Oxidation of Petroleum Fuels - Noreas Inc.
NOREAS, working with SDV Engineering & Construction, JV, implemented an In Situ Chemical Oxidation (ISCO) pilot test at Site 4, Marine Corps Mountain Warfare Training Center (MWTC), Bridgeport, California. NOREAS’ involvement began with an evaluation of previous investigations and remediation efforts performed at this former fuel station and large (4,000 gallons diesel) surface spill site. An AS/SVE system in operation at the site for many years was not capable of meeting remediation goals. 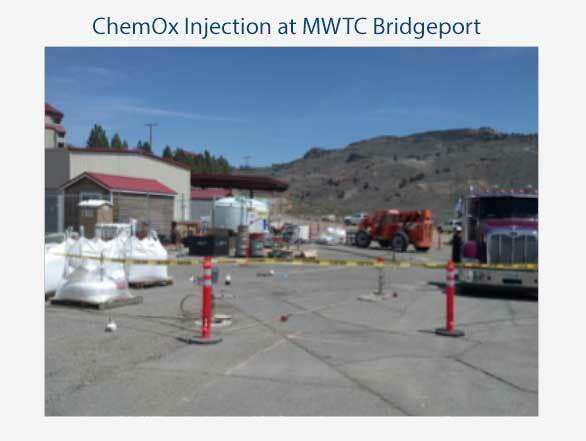 NOREAS identified that ISCO, using activated sodium persulfate, was the most appropriate remedial technology, given the nature of the contaminants, depth of contamination, and the need to minimally impact MWTC operations. Groundwater was impacted with up to 5,300 µg/L of TPH-d and 3,700 µg/L of TPH-g. The plume covers approximately 4 acres and is characterized by interbedded high permeability zones with rapid groundwater flow. NOREAS recommended in situ source area treatment of over 2,600 cubic yards of impacted soils, largely present in the uppermost portion of the aquifer in soils that are seasonally saturated during the spring snow melt. NOREAS installed 25 ISCO injection wells at the site; each well containing a custom-designed screen interval targeting only TPH-impacted soil zones. NOREAS worked with MECx, LLP, in the completion of a bench-scale test using impacted soils and groundwater collected from the site, demonstrating the effectiveness of the selected technology. Two injection events were performed in Spring 2011 and 2012. Results to date indicate a substantial reduction in groundwater contaminant concentrations and contaminant mass was achieved, with concentrations approaching the project remediation goals. 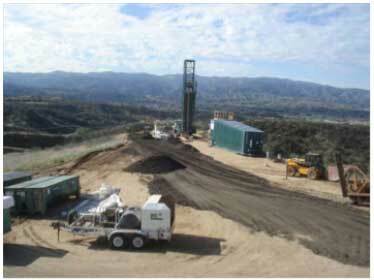 Installation and injection of persulfate into five new injection wells was completed in Spring 2013.